Two jihadists massacred people at a Christmas party and the Left refuses to call it Islamic terrorism. 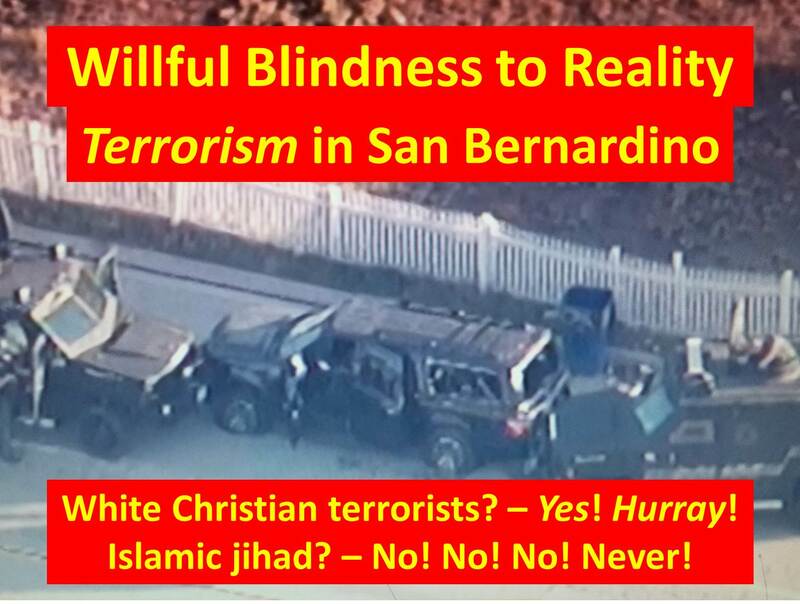 While events were unfolding, the “mainstream” media and liberal blogosphere was awash with speculation that white, Christian, anti-government militia were behind the attack. They appeared to relish, yet again, an opportunity to bash both Christians and conservatives and to continue their efforts to redefine terrorism away from its real meaning and source. But the moment it was discovered that devout adherents of Islam were the attackers, the term “terrorism” lost its relevance and the religious motivation behind the attack became moot. The preferred liberal narrative of widespread Christian terrorism and denial of Islamic jihad was again was thwarted by reality. Their perverse logic emanates from a distorted worldview in which America is always to blame for having exploited the world and must atone by humbling itself before dictators, tyrants, and terrorists. Only then will we be at peace. Huh? Blame America for being targeted by Islamists? We’re the guilty ones? The “American,” Syed Farooq, clearly didn’t think very highly of America or his fellow Americans. Farooq waged a religious war on us. Looking at the facts, Islam is indeed responsible for 99.99% of the violence perpetrated in the name of religion. It’s called jihad with the purpose of imposing a global Islamic caliphate upon the world by force and political/cultural subjugation. The Islamists – on a daily basis! – state their goals very clearly, and they zealously act to achieve those goals, which are prescribed in the Koran. To deny this truth is irrational folly – and suicidal at that. As for that “particular resonance in the current presidential election,” has Salon not seen the carnage being perpetrated in the Middle East by Islamist barbarians who have created a terrorist state which seeks to engulf the world? Are they not witnesses to the barbarism which has invaded Europe and is now invading America? Emulating Obama, the Left asserts it is not American to protect Americans from those who would seek to destroy America. This entry was posted in Uncategorized and tagged 9/11, Al-Qaeda, appeasement, Barack Obama, Boston Marathon massacre, climate change, Draw Mohammed Contest, evil, Fort Hood massacre, Geert Wilders, gun control, ISIL, ISIS, ISIS is contained, Islamic jihad, Islamist, jihad, JV team, pacifism, Pamela Geller, Paris terrorist attack, persecution, refugees, Robert Spencer, Salon, San Bernardino attack, Syed Rizwan Farook, Tashfeen Malik, terrorism, Tsarnaev brothers, Wahhabism, war, war on terror on December 4, 2015 by BrotherWatch.